"Pi, Why?" 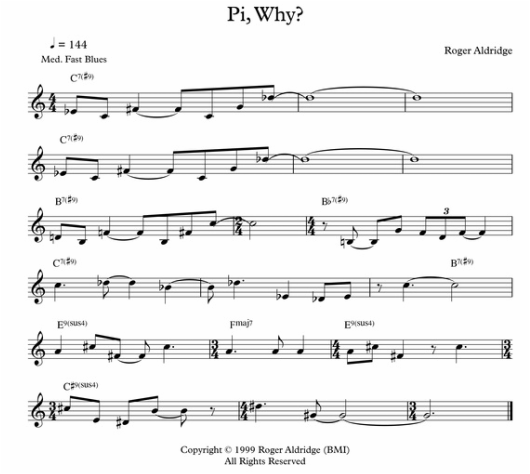 is an unconventional blues that uses Pi (3.1415926....) as a sequence of melodic intervals. Do not let that scare you away -- the music swings. The structure of this 18-bar tune is based on 3-bar phrases and there is shifting time in places. Recorded by Amy Leonard, violin; Jason Shapiro, tenor saxophone; E. Shawn Qaissaunee, guitar; Peter McCarthy, bass; and Skip Rohrich, drums. The first 32 numbers of Pi are used in this tune: 3.1415926535897932384626433832795. Here is how I converted the Pi numbers to melodic intervals: Simply, each number becomes an interval in relation to the root of the chord used at the time. That is, the relationships change when the chords change. The intervals are natural or altered (b9, #9, #11, etc.) chord tones or higher tensions. For 3 on V7 chords, I use either natural 3 or minor 3 (enharmonically #9). The tune starts with the sequence of 3 (#9), 1, 4 (#11), 1, 5, 9 (b9) played twice with C7 (#9) and then transposed down a half-step for B7 (#9). The next sequence -- 2 (b9), 6, 5, 3 (natural), 5 -- is played with the Bb7 (#9) chord and so on through the rest of the 32-note sequence. While 3 is the first number of Pi, that is not why the tune is structured with 3-bar phrases. Simply, the 3-bar phrases felt natural and swinging to me. This tune has a strong blues flavor; however, it is not a conventional 12-bar blues in its structure or chord progression. The A part is 12 bars. Then, the B part is 6 bars with alternating 4/4 and 3/4 (one can think of it as 7/4). The B part also has a harmonic shift from V7 (#9) chords to V9 sus4 and major 7th chords.